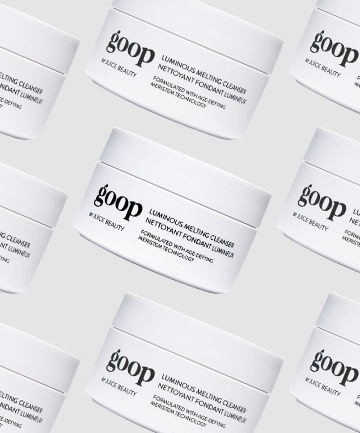 Best Natural Cleansing Balm for Sensitive Skin The pristine natural formula of Goop by Juice Beauty Luminous Melting Cleanser, $90, is probably this product's biggest selling point: It's made primarily of botanical oils and extracts, and 75 percent of the ingredients are organic. Also notable are what the formula doesn't contain: parabens, petroleum, pesticides, propylene glycol, butylene glycol, phthalates, sulfates, PEGs, TEA, DEA, GMO, silicones, gluten, artificial dyes, or fragrances. Of the newest cleansing balms, this is No. 1 for removing stubborn makeup and the best dupe for Eve Lom's trend-setting cleansing balm. (More on that one later.) It comes with a muslin cloth for scrubbing, and it has a satisfyingly thick -- dare we say, goopy -- texture.